India has only about 4 per cent of the world’s renewable water resources but is home to nearly 18 per cent of the world’s population. It receives an average annual precipitation of 4,000 billion cubic metres (BCM) which is the principle source of fresh water in the country. However, there is wide variation in precipitation across different regions of the country. India has about 20 river basins. Due to increasing demand for domestic, industrial and agriculture uses, most river basins are water stressed. This is further accentuated by the fact that water demand is unevenly distributed across the country. Increasing demand from a growing population, coupled with economic activity, adds pressure on already stressed water resources. Per capita annual water availability reduced from 1816 cubic metre in 2001 to 1544 cubic metre in 2011. There is high variation in per capita water availability ranging from 263 cubic metre (CM) in the Sabarmati basin to 2013, 6 CM in Ganga-Brahmaputra-Meghna system. With the country already experiencing water stress, there is need to augment both water supply in water-rich regions lacking infrastructure and manage water demand in water-scarce regions. 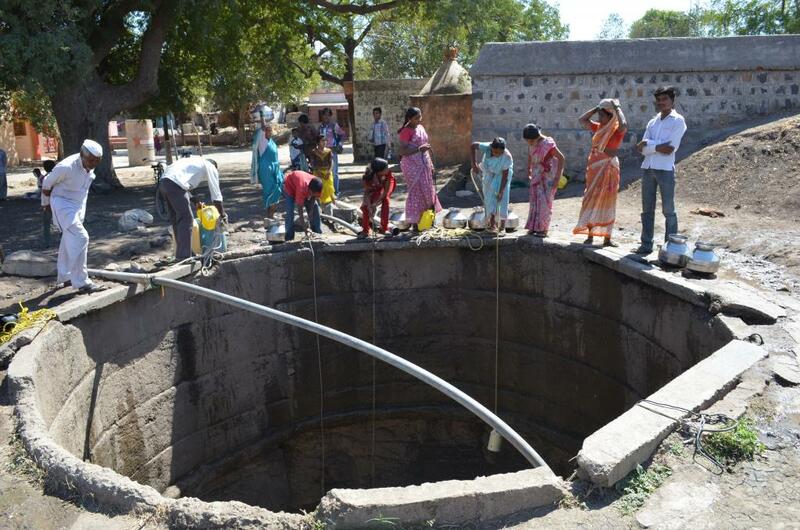 Groundwater plays an important part in India’s economy. It caters to about 85 per cent of rural demand, 50 per cent urban requirements and more than 60 per cent of our irrigation needs. Unregulated groundwater extraction has led to overuse in many parts of the country, causing the groundwater table to plummet, drying springs and aquifiers. According to the CWG Report 2011, the annual groundwater draft is 245 BCM, which is account for about 62 per cent of the net water available. Of this, 91 per cent was used for irrigation. However, the effects on ground water in different regions of the country have not been uniform. The situation is alarming in regions where groundwater exploitation exceeds replenishment. States like Haryana, Punjab and Rajasthan now draw more water than is annually replenished. Several places in Rajasthan and Haryana have high salt concentration in groundwater, which makes it not potable. India experiences both floods and droughts periodically. Nearly a third of the country’s geographical area is drought-prone whereas 12 per cent of the area is prone to floods. The effect of global warming further intensifies temporal and spatial variations in precipitation, melting of snow and water availability. Water Pollution Control Act mandated to maintain water quality and restore the wholesomeness of national aquatic resources by preventing pollution. On the other hand, a CPCB report indicated that organic pollution (biological oxygen demand and coliform bacteria) continues to be predominant polluters in rivers, lakes, ponds, tanks and groundwater resources. Untreated waste water from urban settlements and industrial establishments are main reasons for pollution. In River Ganga, discharge of untreated waste along the entire stretch of the river, is the main cause of pollution despite the centrally funded Namami Gange project. National Water Policy 2012 (NWP) made several recommendations for conservation, development and improved management of water resources in the country. NWP stresses that “low consciousness about the overall scarcity and economic value of water results in the wastage and inefficient uses”. Most of the water supplied for domestic uses and irrigation use is highly subsidised, providing little incentive for users to be efficient. Further, the water revenue recovery in India is also poor. Most of the water planning and development in the country has been done as per administrative boundaries rather than by using river basins as the hydrological unit. This has led to water conflict as most river basins are shared by several states and water demand for meeting domestic, industrial and agricultural needs within each state has gone up significantly. In the absence of river basin management plans and active river basin authorities, these issues have intensified. The variability of water resources across India demands a basin-by-basin analysis. Variation in rainfall means replenishment is unevenly distributed over time. This makes the management of water including with storage facilities for recharge, even more important than just absolute quantity of water availability (Water Challenges in India,The EU and India:Partnering to address water challenges). Agriculture sector consumes the largest amount (over 85 per cent) of India’s water. Consumption of water would escalate further with pressure from industrialisation and urbanisation. It has been estimated that by 2050, more than half of India or an estimated 800 million people will be living in urban India. Most urban areas will have to import water from further distances unless measures are taken to improve water use efficiency, reduce leakages, adoption of appropriate water tariff, rehabilitate and recharge local water bodies considering many parts of rural and urban areas suffer from insufficient water for daily use (S.B. Shinde:Present scenario and future challenges of water management in India). Under Indian Constitution, the subject “water” is in the state list. However, the Centre has the mandate to resolve conflicts over use of inter-state rivers. Centre also plans water allocation and provides technical support for large projects in generation of power, irrigation and drinking water. In India, water governance is fragmented which leads to inconsistent water policy between the Union and states, observes Shinde.